Tomato season got a slow start this year but my favorite vegetable finally has hit its stride. Ripe and juicy heirloom tomatoes overflow the tables at local farmers markets and their bright, intense flavors are just the ticket for a terrific gazpacho. You don’t need a super powerful blender to make this spicy cold soup, however. Any food processor or blender will suffice, but you may want to pass it through a food mill as well to achieve the smoothest texture. The VitaMix eliminates that step. This gazpacho, a specialty of Andalusia in the south of Spain, makes the most of the season’s best produce. It’s an uncomplicated dish that depends on the ripest tomatoes and good quality olive oil for its impressive flavors. A little bread thickens the texture and makes a substantial soup for a summer evening – no heat required. You can’t ask for much more at this time of year. Chop tomatoes, cucumber and bell pepper. Reserve about 1 cup of each vegetable for garnish, cover and refrigerate for later use. Place remaining chopped vegetables and minced garlic in blender jar or work bowl of food processor. Soak bread briefly in a bowl of cold water and squeeze dry. Add bread, cumin, salt, olive oil, and vinegar to vegetables in the blender or processor. Whirl until smooth. (You may want to use a food mill or strainer to get a truly silky texture.) If the mixture is too thick, thin with a little water. Chill for at least four hours or overnight. 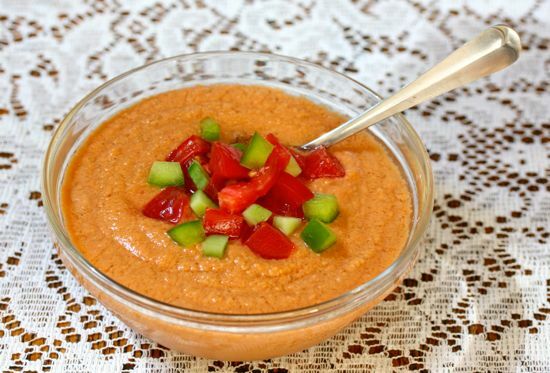 To serve, spoon gazpacho into bowls, garnish with a generous spoonful each of the reserved tomatoes, cucumber and pepper, and drizzle with a little olive oil if desired.